First organized by the Queens Museum in Fall 2017, The Wandering Lake, 2009-2017 is now open to the public at The Institue of Contemporary Art, in Los Angeles! This is Chang’s most ambitious work to date, an eight-year project that redefines the role of artist, image, object, and performance in the construction of narratives through an exhibition that integrates video projection, photography, sculpture, publication, and performance as one expansive body of work. The exhibition allows viewers to navigate through Chang’s personal, associative, and narrative meditation on mourning, caregiving, geopolitics, and landscape. The exhibition has been structured to replicate the complex way in which stories develop through geography, history, cultural mythology, fiction, and personal experience. While Chang’s multi-year project was in part inspired by turn-of-the-century colonial explorer Sven Hedin’s book The Wandering Lake (1938)—which tells the story of a migrating body of water in the Chinese desert—the project also chronicles the loss of Chang’s father as well as her pregnancy and the birth of her son. Click here for more information about the exhibition and public programs. 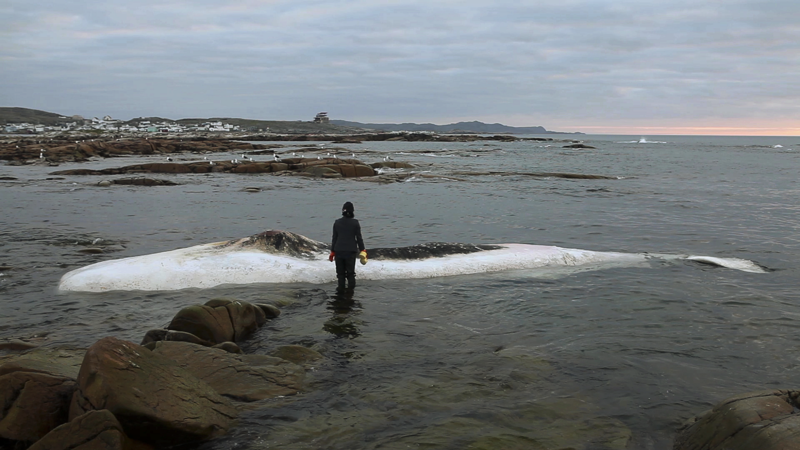 Image: Patty Chang, Still from Invocations for a Wandering Lake, Part I, 2015, Video Projection, color, sound, TRT 12:49; installation dimensions variable. Courtesy the artist and BANK/MABSOCIETY.